Thirty-three new pieces have been added to the website and can be viewed in the Recent Works Gallery and purchased from the Recent Works Store. Collectively, this art represents the majority of experimental projects I have been working on during late summer and autumn. I have been refining various digital techniques in what I call Procedural Painting, and my newer works reflect these novel artistic processes. The Ars Mathematica 2019 calendar is available for purchase from my Zazzle storefront. This large-sized calendar is based on 13 fractal and abstract works recently created in the past six months. The full price for the calendar is $28.90, but Zazzle runs numerous specials during the holiday season. Check out my Zazzle storefront for details. 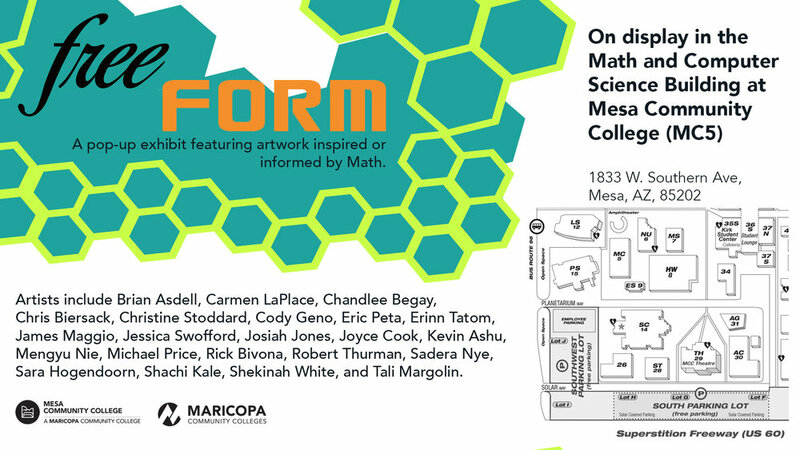 I am honored to have my artwork in the free FORM art exhibition, sponsored by the Mathematics Dept. at Mesa Community College. It is particularly meaningful for me because 40 yrs ago my theoretical work on the orbit of mercury was accepted for publication in the American Journal of Physics. Things have come full circle combining my loves of math and art! The exhibit runs until January 2019. Holding my physics journal article next to my framed piece titled, Schiele's Clocks (Red Variant). This is the first in a series of monthly blog posts that I plan to write explaining the stories behind the images I create. Since the juxtaposition of modern science and spirituality is a theme often explored in my imagery, I have decided to begin with one of my favorites from a couple years ago, a surrealism-inspired print entitled, The Copenhagen Interpretation. The initial inspiration for this piece came to me following a lengthy discussion I had with a group of friends concerning quantum mechanics and spirituality. The early 20th century brought forward two major developments in physics: the theories of general relativity and quantum mechanics. Both of these new theories stood the old Newtonian view of the universe on its head. In this discussion I am only going to concentrate on quantum mechanics, since my piece is an artistic portrayal of one of the central aspects of this mind-boggling physics of the microscopic. To fully appreciate the revolutionary approach that quantum mechanics represented, it is important to remember that the physical world was seen as a mechanistic creation of discrete objects precisely interacting with each other based on universal forces. Newton's equations and the invention of calculus were the mathematical language that described this universe prior to the revolutions of modern physics. The rise of technology in the late 19th century that allowed for experiments to focus on the tiniest elements of creation took scientists down a new road that led to the development of quantum mechanics. Experiment after experiment showed that the tiny world of the atom behaved in a probabilistic manner, and not in a concrete fashion as the macroscopic world we are normally used to living in. This meant that it was impossible to precisely predict the behavior of a single subatomic particle (like an electron) as it would be with Newtonian mechanics, but that it was completely possible to predict with astounding precision the aggregate behaviors of large numbers of subatomic particles. The mathematics was clear, but how to interpret the math was in dispute amongst the leading theoreticians of the day. The crux of the dilemma was how to make sense of a theory that was indicating that the fundamental nature of individual particles of matter existed as mathematical probabilities with discrete physical outcomes, but any one of those outcomes did not actually materialize until the particle was observed and interacted with in some way. And the theory indicated that it was not a "lack of precision" of the observer that prevented precise knowledge of the particle, but that instead it was a fundamental nature of existence. In the mid 1920's, physicists discussed several interpretations to the probabilistic nature of quantum mechanics. The Copenhagen Interpretation was one view that arose from those discussions; the other was the Many Worlds Interpretation. The major difference between these two schools of thought had to do with the interpretation of the wave equations that describe the probabilistic character of subatomic particles. The Many-Worlds theorists believed that these probability waves were actual physical realities associated with particles; and therefore whenever an experiment was run that had several potential outcomes, every result actually occurred, but each in a different universe. So, if an experiment was conducted where there were three distinct outcomes predicted, the Many-Worlds physicists believed all three outcomes would happen, each in their own separate universe. The Many Worlds view postulates a multiverse of countless universes in existence. The Copenhagen Interpretation put forth the notion that the wave function is only a mathematical construct to help explain the nature of subatomic particles, but that it is not part of physical reality in and of itself. Therefore, the observed outcome of an experiment is the one and only reality, and the wave equation that precisely described the particle's potential behavior prior to the experiment no longer exists nor is valid afterward. In the 90 years since this fundamental debate began, this core concept has not been universally resolved. I wanted to create an artistic piece that would reflect my academic training in physics and astronomy, along with the teachings that I have received from the Native American elders I have been fortunate enough to study with. Quantum mechanics seemed like a good nexus point on a number of levels. My visual inspiration came from two surrealist artists I admire, Rene Magritte and Salvador Dali. Both were masters of creating engaging imagery that cause the viewer to react and reflect on the dreamlike settings they produced in their art. The revolutionary nature of quantum mechanics and the animistic qualities of Native American spirituality provided me a wonderful opportunity to share something of myself with others using a surrealistic setting as my medium. 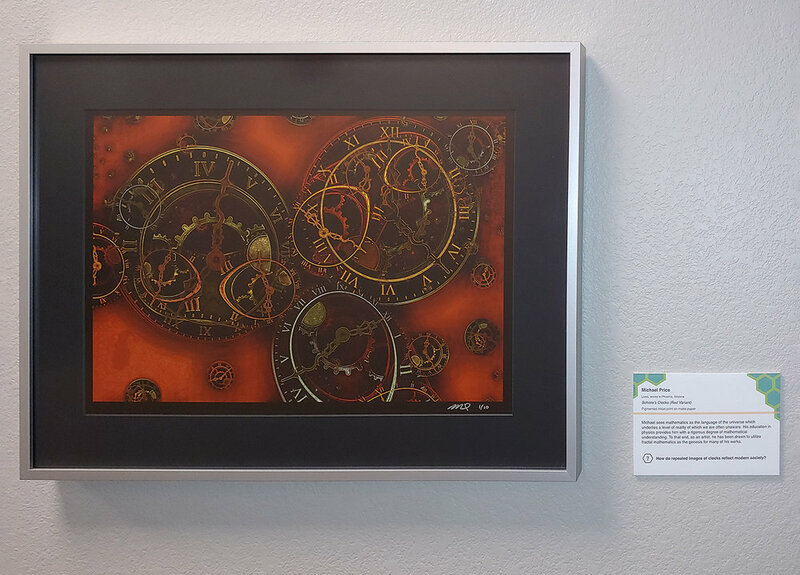 There are two distinct settings presented in this piece, the "real world" of everyday life seen in the landscape within the open window and the mathematical construct of the quantum world shown in the stark space enclosed by the rusted wall and floor. The decayed, rusty backdrop of the quantum space represents the dying nature of the old Newtonian world. The open window and the eyeball symbolize the awakening of new perception to the nature of the universe that quantum mechanics brought forth. The shadow of a cat cast along the rusted floor is an allusion to the famous quantum mechanics thought experiment, known as Schrödinger's Cat. The main action in the piece portrays a hand reaching up through the window from the real world into the quantum setting, while simultaneously trying to grab one of three distinctly shaped and colored floating objects. The size of each object represents the probability solution to the wave equation as formulated in quantum mechanics. The yellow object is the most likely result statistically and the object the hand will most often grab, the magenta object is the next most likely result, while the blue object is the least likely event and the object the hand will select least often. So, the scene in The Copenhagen Interpretation represents the moment just before the event (object selection) occurs, when all three distinct solutions to the wave equation are possible. However, once one of the objects is selected, the event concludes, there are no longer three possible outcomes, and the hand returns back into the real world. Even though the chosen object defines the result of the event, there is no way to know precisely which object will be selected beforehand. This indeterministic quality inherent in quantum mechanics combined with the Copenhagen Interpretation of the wave equation has helped to shape my spirituality and provide meaning to this piece in two significant ways. The first is that nothing is completely certain at the smallest most fundamental level of creation and everything in the universe exists as potential. The second is that we, as human beings, are creators and our "gift" lies in our ability to make choices. Every choice leads us on a path to new potential opportunities and new teachers. This is the first in a series of monthly blog posts that I plan to write explaining the processes, techniques, and technology behind the digital prints I create. The scope of these articles is not meant to be tutorial in nature, but more an examination of my approach to producing digital imagery using the tools I have at my disposal. From a production standpoint, The Copenhagen Interpretation can best be described as a composite image. This means that there are a number of different visual elements from varying sources that have been merged together to create the final piece of artwork. The concept of composite imagery can also be found in traditional art as well, such as collage and mixed-media. It took me several iterations distilling down some key concepts in quantum mechanics for me to produce a rough mental sketch of the artistic direction I wanted to go in. I ultimately decided on a surrealistic feel overall, visually combining elements of photography, 3D, and digital art. The process and techniques used to create and then merge the individual visual elements together, resulting in the final image, are described below. The following table lists all the visual elements in The Copenhagen Interpretation and their sources. The main environment (the wall and floor) has a photographic quality, because the marriage of photography and physics reflect the rise of modern technology in the 20th century. I decided to incorporate a rusty backdrop as a way to portray the decaying nature of classical physics in the face of quantum mechanics. I used Adobe's Lightroom program to review my collection of photos taken specifically for composite work to find just the right backdrop. The original photograph used in this piece is actually a part of a flat section of metal wall. However, since I needed to create a 3D space for the backdrop, I took the rusted wall photo into Photoshop, selected the bottom quarter of the image, and manipulated it to produce the illusion of a floor. This was accomplished by performing a perspective transform on the selection (widening the foreground) and then overlaying a gradient shadow (transparent to dark gray). Once the floor background was created, the backdrop was complete and the other visual elements could be layered in one-at-a-time. The cat shadow was next to be added. It's included in the piece because of the famous thought-experiment known as Schrödinger's Cat. The shadow image was initially created using Bryce 3D. A simple scene was set in 3D program so that the cat model cast a shadow in the general direction needed for the final piece. The image generated from Bryce 3D was saved and imported into Photoshop. The shadow was carefully selected and copied, and then placed into a layer in the working Photoshop file for The Copenhagen Interpretation project. The shadow image was stretched to match the floor's perspective, layered in using the darken blend mode, and blurred slightly to soften its edges. In the final piece, the cat shadow "looks" in the direction of the open window, adding just another extra special surreal quality to everything. With the placement of the cat shadow complete, the image of the open window and landscape scene was worked on next. Bryce 3D was once again used to generate the window and frame assembly, as well as the eyeball floating above the landscape which symbolizes the experimental observer. The saved image was then imported into a Photoshop layer in the working project file. The Bryce 3D sky was carefully selected and removed, then replaced with a much more dramatic sky I had photographed in the past. The entire window and landscape image was resized to fit into the surroundings, and then rotated 90° counterclockwise to orient it horizontally. A final perspective stretch was applied to the image so it would match the floor's perspective. The seemingly strange positioning of the window within the floor reflects the seemingly strange notions that quantum mechanics has caused physicists to contemplate the past 90 years or so. With the location of the open window established, the creation and placement of the hand followed. I wanted the hand in the finished piece to have character; one that had some years on it. I decided that I needed to photograph a hand using lighting that would both enhance dimensionality and highlight wrinkles and lines. A friend agreed to let me photograph her hand and forearm, and I picked the image that best portrayed the characteristics I was looking for. The image was brought into Photoshop and the hand and forearm was carefully selected and cropped. The cropped image was copied, placed, and resized in a new layer in the Photoshop project file. A gradient mask was applied to the layer in order for the forearm to look like it faded in from the landscape. Finally, the hand needed an "other-worldly" appearance, since it's not part of the quantum world. This was accomplished by applying the difference blend mode to the layer. As an extra benefit, the resulting iridescent quality of the hand actually helped to highlight the lines and wrinkles in the skin. The last step in completing The Copenhagen Interpretation involved visualizing artistically the wave equation probability solutions. I needed a creative approach to portray the mathematics imbedded in quantum mechanics. After some experimentation, I decided to create three abstract sculpted wave equation objects in Photoshop 3D. The size, color, and position of each 3D object reflects the probability solution of the experiment (the chance the hand will pick the object) portrayed in the artwork. After each wave equation object was fully colored and textured in Photoshop 3D, it was then copied into a new layer of The Copenhagen Interpretation project file. Here, each was sized, rotated, and positioned individually to emphasize both the aesthetics and physics. After some very minor tweaks, the overall image felt done. I saved the Photoshop file and designated it the master file for The Copenhagen Interpretation. It has been a common practice for traditional artists to create limited edition prints of their artwork. In most circles these would be considered reprints of an original piece. Likewise, many professional photographers offer limited editions of their best work. Almost all artists and many photographers work with professional printers who specialize in creating prints of high quality. Typically, the artist or photographer decides on a specific print run, anywhere from 10 to 50 to several hundred to maybe even a thousand. After those prints have been made, the artist/photographer signs and numbers them. This is a fairly established practice in the art world. All of my digital artwork and fine art photography is created, developed, and printed personally by me on my own equipment. All my works are digital originals: none can be considered reprints. The digital print is my medium. I work in no other. Also, my Limited Editions are restricted to 10 prints, while my Signature Editions are only single prints. This keeps the number of multiple prints low and, for me, more personal. I do not print any of my images ahead of time or in batches. I only print an image after it has been ordered. For me, as an artist, I do this so I can have a direct connection to my collectors and also to my own work. The final aspect in all of this are the newly updated Certificates of Authenticity that I now incorporate with all prints sold. I have made the decision to utilize Hahnemühle's watermarked Certificate Of Authenticity and Hologram System. (Click on the link for more information.) These certificates reliably authenticate the genuineness of my work by employing a matching pair of serial-numbered holograms - one on the certificate and the other identically numbered one on the reverse side of the print. In addition, all prints sold are registered on Hahnemühle's Art Registry website. My new certificate system adds a level of integrity and value to all my work sold. The two most important and enduring aspects of selling my work are the personal connection I want with my collectors and the limited number of prints I want available to be sold. The Certificate of Authenticity and Hologram System from Hahnemühle helps me to accomplish these goals, along with printing my own work and limiting the number of prints I make per image.